The Titan supercomputer at the Oak Ridge Leadership Computing Facility (OLCF) has enabled scientists to explore an unexpected oxidation state in the rare, radioactive element berkelium that was first observed in experiment. The OLCF is a U.S. Department of Energy (DOE) Office of Science User Facility. An atom's oxidation state is characterized by the number of electrons it exchanges to form a compound and provides information on how an element interacts with the surrounding environment. Published in April in Nature Chemistry, the study is helping to fill in gaps in the fundamental understanding of berkelium and could have future applications for low-toxicity separation in nuclear waste management. Scientists from Lawrence Berkeley National Laboratory (Berkeley Lab) acquired a minute sample of the most common berkelium isotope, Bk-249, from DOE's Oak Ridge National Laboratory (ORNL) through the DOE Isotope Program. Incidentally, the element and Berkeley Lab are namesakes of Berkeley, California where the element was discovered in 1949. At ORNL, radioactive isotopes for research, including Bk-249, are produced and purified with support from the DOE Isotope Program, which recently contributed to a separate and highly publicized study—the discovery of element 117. The new element was officially named "Tennessine" thanks, in part, to ORNL's role in synthesizing the berkelium required for its creation. 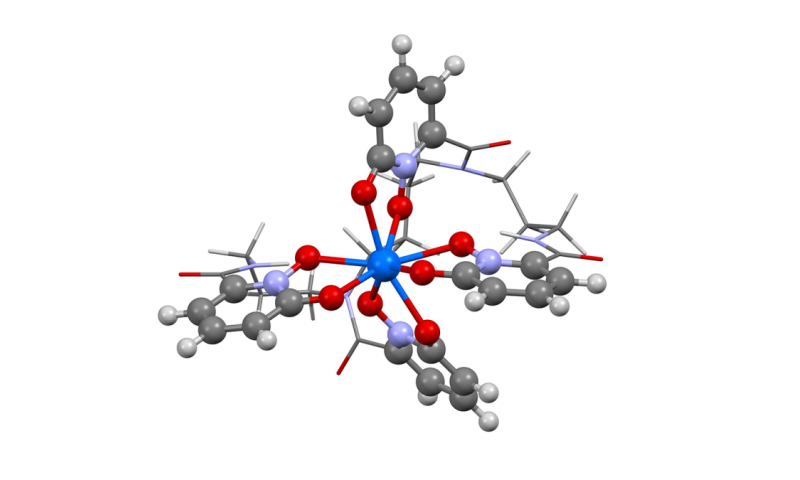 Although berkelium was first synthesized over 60 years ago, its isotope is produced in such small amounts and remains stable for such a short time (less than a year) that its fundamental structure and properties are rarely studied. Producing Bk-249 is also a lengthy undertaking that includes many precise steps and the expertise of an entire staff of scientists and engineers, said Julie Ezold of ORNL's Nuclear Materials Processing Group. However, scientists do know many properties of berkelium. With an atomic number of 97, it occurs in a class of elements known as the actinides, which are metallic, radioactive elements with atomic numbers between 89 and 103. Uranium and plutonium are also actinides, yet most of their respective isotopes have much longer half-lives than Bk-249 and emit high-energy alpha particles, whereas Bk-249 emits lower energy beta particles. Researchers at Berkeley Lab are using high-powered X-ray crystallography and mass spectrometry to study the chemical structure of Bk-249 and how it may interact with the environment. "We've been investigating the spectroscopic properties of the heavier actinides to gain a more fundamental understanding of these elements, which have applications in the nuclear fuel cycle and waste management," said Rebecca Abergel, research scientist and principal investigator at Berkeley Lab and a 2014 winner of a DOE Office of Science Early Career Research Program award. Abergel's team of actinide chemists, including Gauthier Deblonde, worked closely with protein crystallographers from Roland Strong's laboratory at the Fred Hutchinson Cancer Research Center. In the course of their experimental work, Abergel's team noticed something strange. Previous research has shown all trans-plutonium actinides (those with atomic numbers greater than plutonium, or 94) to stabilize in a +III oxidation state—a property that describes how the element makes chemical bonds. To explore its chemical boundaries, scientists have tried to push berkelium into the +IV oxidation state using highly acidic chemicals, but the effect, though possible, is fleeting. In this study, Abergel's team bound the Bk-249 to a synthesized organic ligand, which is a molecule that binds to a central metal ion (in this case Bk-249) to form a compound. The team has previously used this ligand on actinides for its ability to bind with that class of elements. By capturing the structure of the Bk-249 while bound to the ligand, researchers expected to learn more about berkelium's structural and chemical properties, including its +III oxidation state. "We use natural molecules, or ligands, made from bacteria to bind to actinides. A couple of those molecules are bound by proteins, so you end up with a system including a protein, ligand, and metal (the actinide) bound together," Abergel said. "In this case, the protein did not bind to the metal-ligand complex, indicating a +IV oxidation state." Unlike acidic chemicals, an organic ligand could offer a more natural and easier alternative for waste management applications. To help shed more light on the interesting experimental results, Abergel's team turned to computational scientist Wibe (Bert) de Jong, Computational Chemistry, Materials and Climate group leader at Berkeley Lab. As part of a large-scale Innovative and Novel Computational Impact on Theory and Experiment project focused on fundamental actinide chemistry led by David Dixon at the University of Alabama, de Jong used the 27-petaflop Titan system at the OLCF to simulate Bk-249 binding to the ligand then generated corresponding spectroscopy data. "Actinide chemistry is a difficult field in general with very little experimental data available," de Jong said. "Computing is helping a lot by verifying experimental results, informing the design of new experiments, or serving as a replacement for experiments so researchers don't have to deal with the radioactivity." Simulations on Titan and the OLCF's 736-node Cray XC30 Eos included about 100 atoms, capturing how Bk-249 binds to the ligand in both +III and +IV oxidation states. The computational study used NWChem, a scalable computational chemistry code that can run efficiently on thousands of computer processors. To compute the large number of excited states present in molecular systems like the metal and ligand compound in this study, the team relied on significant advances in NWChem that were developed as part of a Scientific Discovery through Advanced Computing (SciDAC) project led by Chris Cramer at the University of Minnesota, for which de Jong is a co-principal investigator. "After we did the calculations, we generated spectra that we could directly compare to those generated by Abergel's experiments," de Jong said. By translating the computational data into what it would look like as experimental data, researchers were able to confirm that they had indeed observed a +IV oxidation state in experiment. "The ligand actually allows the berkelium to oxidize from +III to +IV, so this tells us a lot about how environments can change the physics and chemistry of actinide elements," de Jong said. Researchers are planning to use more computational modeling and simulations in extensions of this study. "We've been extending it to the whole series of actinides to understand the systemic trend for bonding in this series," Abergel said. "We're just at the beginning of this, but it means we're getting a better understanding of how chemistry affects how the element interacts with the environment." Computational actinide chemistry: Are we there yet?